I picked up an A9 from Wakefield on Saturday. Fired it up and it looks like its got a bare OS and nothing else. I've got a 256Mb usb stick plugged in, but can't make out if it doesn't recognise it or I can't seem to find the "Filer" app to access it? Can anyone give some pointers please? I've also noticed that unless I plug the keyboard in after its booted the mouse won't work? Also if I change the screen resolution the next time I boot up its not saved the changes, I can't see a way to shut it down other than pulling the plug? Switcher (icon at bottom right) -> Shut down. That confused me! I tried everything I could think of to get that and then pressed the scroll wheel on the mouse and presto! In the Resources:$ folder the icons for Apps and Discs have an open folder with pages showing but I can't access them. Plain folders open fine? - To use Risc OS, you need a 3-button mouse. Left= "Select", for selecting things and generally making things happen. Right = "Adjust", which is the same as Select but slightly different (ie, a minor variation on the same action). - Sometimes you can use key+mouse combinations such as shift-click, or shift-drag. ... so to get the menu which contains the main system functions, you need to click "menu" on the main system icon. The other icons on the icon bar will produce their own menus as well. Another important point is that you can get a command line by pressing F12. At the command line, *HELP shows a list of possible commands, pressing return on a blank line returns to the desktop. *BASIC starts BBC BASIC. 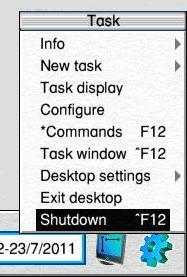 And finally *SHUTDOWN will do the same thing as clicking Shutdown on the desktop. I hope this is useful! I'm still in need of some help with the keyboard on boot and what usb sticks will work and what format do they need to be? I think the apps are there (17 files listed) but I can't open the folder??? Bat wrote: In the Resources:$ folder the icons for Apps and Discs have an open folder with pages showing but I can't access them. Plain folders open fine? Ok. Figured this out... If you have a folder open elsewhere on the screen it shows the icon with the pages. When you close it the icon changes to the plain folder. How can I get them on to the A9 though? If it needs drivers for a USB stick I'm in the smelly stuff! Can't help RE the USB side. On my RiscPC, I need to manually add each USB device to a list for it to see it. On my Raspberry Pi, it sees it automatically. I've never seen, or used, an A9 Home so have no clue. Hopefully someone will come along who knows more, or you can contact the supplier direct for help. As for getting stuff onto the machine - I assume it has a network port and you can hook it into your Broadband router? Only issue then is (apart from how to set up the network, but we'll come to that), does the A9 come with a browser installed? Done a quick bit of research. The A9home is supplied by CJEMicros (http://www.cjemicros.co.uk/micros/products/a9home.shtml) - Chris Evans is pretty good with support and sometimes posts on these forums. The software for the USB uses the Simtec USB stack (http://www.simtec.co.uk/products/SWUSB) - Simtec are bad at not responding to emails...or, at least, used to be. Thanks Gerard, I've been looking at the same things last night. Somehow, by luck more than judgement I think, I've got !MassFS in the apps folder. Only problem being I haven't got enough stack apparently! I would try (and this is just guessing) dragging the red bar (System heap/Stack), currently at 124K, to something bigger. If you SHIFT-double click on !MassFS it will open the directory and their may be a !Help file held within (or middle button over it and see if there is a help option). It never crossed my mind to just drag it across as I'd read somewhere the red bar meant it was set by the computer. Anyway, even with it at 3040, as far as it will go, I still get the same message. What happens if you click on USB in !Configure? I get USB config with Core, Drivers and Files icons. I clicked on Drivers, then open directory. Here I added the app file "!08-06-50U" from the !MassFS directory as there are other files in there with the same icon. Rebooted but still refuses to work! I plugged my old card reader in and all these icons appeared at the bottom! Not sure about the question mark on each one? I had tried this previously and nothing happened. I'm guessing adding the massFS driver into USB has got this working. It's still flakey you have to plug it in after booting up and sometimes only reads the cards properly on the second attempt. Here's a picture off the micro SD card. Not sure why the quality is not very good? Its USB setup does require manual fiddling as others have mentioned, and you'll probably find it will only deal with memory sticks/cards of less than 2GB. RISC OS 4.42 was the first and only full 32bit(*) build of RISC OS 4. As such it is not compatible with any software produced pre 2003ish. Also as so few were sold and it was pretty much an abandoned product, most new software will never be tested on it and might not work either! In particular Aemulor and ADFFS, the two bits of software available to help run old stuff, probably won't work on it, No other version of RISC OS works on the A9home. Sorry to not be more positive, they were cute little machines for the time, but if you want to play with RISC OS now then you'll be much better off getting a RaspberryPi and putting RO5 on that. That sounds like the sort of error you get if you've unzipped it on a PC and then transferred it across. Do not do this! Always unzip on RISC OS otherwise all the filetypes get lost. Your best way around this is to download the self-extracting SparkFS, transfer that file across to RISC OS, settype it to Utility and run it get the read-only SprakFS. Use that to unzip NetSurf. I think this one may have been cleansed or something? Good news is I didn't pay anywhere near the £616 a new one costs! Well I've had a few days off from this, which seems to have helped I think ? I've now got SparkFS installed and running, this enabled me to get NetSurf installed. If nothing else I can at least use this little blue box to browse *. Thanks to all for the contributions, I now feel like I know something about RISC rather than being sure I knew nothing like at the start! geraldholdsworth wrote: Can't help RE the USB side. On my RiscPC, I need to manually add each USB device to a list for it to see it. On my Raspberry Pi, it sees it automatically. I've never seen, or used, an A9 Home so have no clue. Hopefully someone will come along who knows more, or you can contact the supplier direct for help. Is there some instructions on how to add a USB device somewhere please? My card reader sort of works but I have to leave the machine on for 5 minutes after booting before I dare to plug it in and then they don't always get along! Bat wrote: Is there some instructions on how to add a USB device somewhere please? I can't find the documentation I used, and I can't remember off the top of my head how to do it (haven't touched my RiscPC in a few years - it got superseded by a Raspberry Pi!!!). I thought the Simtec website covered it, but have found http://www.riscos-usb.com. Still can't find the documentation though...unless it has changed with the new version of !MassFS. I can remember that you need to type a '*' command (*usbdevices, IIRC), then look for the details of the device you're adding, and add the parameters given to a text file inside the !MassFS directory. I'll take a look at that. I've been going through the risc 5 manual this morning in between snoring so will try and get things backed up before I meddle, which isn't at all like me! A9home is USB1.1 only. Use small sticks, at most 2 GiB and FAT12/FAT16 if you want to use them with the bare system (because RISC OS integrated DOSFS had not been extended to handle FAT32 and long filenames back then). You have to configure MassFS to explicitly include the USB stick to be "supported" - don't remember the details anymore. It might contain useful stuff for the A9home. It was made by www.advantage6.com, its runs Risc OS 4 (not sure about 6) but I don't think its compatible with Risc OS Opens version. If you live anywhere near Manchester then get yourself to RONWUG ronwug.org (third wednesday of the month) as one of the designers comes to our meeting. Also there are several people who come that own A9s and would probably sort any issues you have pretty quickly. I've tried the patch and was going to post how amazing it was to have it working. However, once I re-boot it won't regonise what has already worked! Each time I plugged a different stick in it regonises it but then refuses to after restart.